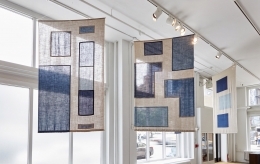 Sean Kelly is delighted to present Ravelled Threads, a thematic exhibition of recent work by ten artists from Africa who utilize fabric to create textiles, weavings, embroidery, performances and installations. These disparate artists are united in their backgrounds, both living and working throughout Africa. 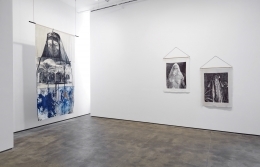 Each artist is distinguished by the diverse and complex relationships that run through their varied geographical, political, and gendered narratives. 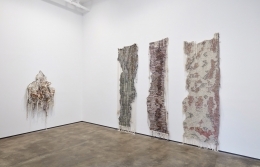 Ravelled Threads is organized in collaboration with Mariane Ibrahim. 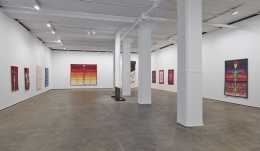 The exhibition will open Thursday, June 21 from 6-8pm. A number of the artists will be present for the opening. Perhaps more so than in any other place in the world, cloth in Africa plays a critical role as signifier, storyteller, and recorder of history. It infuses distinct traditions across the continent, reflecting personal, political and social concerns, serving simultaneously as functional and artistic material. The works included in Ravelled Threads dispense entirely with functionality, positioning these traditional methodologies firmly in the realm of artistic expression. 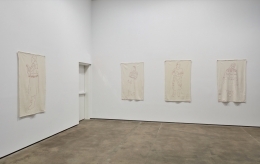 The varied compositions these artists realize may express socio-political resistance, address issues of assimilation and family lineage, ponder issues of cultural and sexual identity, or explore myth. One of the principle issues explored in Ravelled Threads is how artists use material to denounce post-colonial agency and attempt to unravel homogeneous conceptions of what African patterns look like, since much of that conforms to an imperialist aesthetic predominately conceived and marketed in Europe. 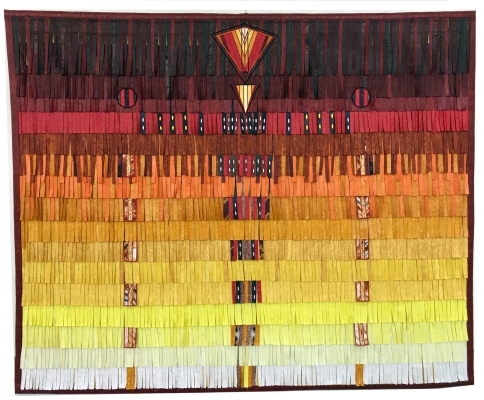 These artists challenge popular ideas that there is a unitary “Africa” in terms of visual, intellectual and sartorial forms of expression, using fabric to reflect new aesthetics and the complex modalities of expression encountered in the richly-varied and complex communities that comprise present-day African cultures. 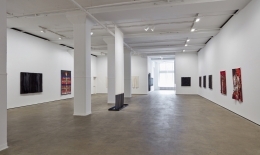 Ravelled Threads features a diverse roster of emerging, mid-career and established artists including Igshaan Adams, Joël Andrianomearisoa, Ayan Farah, Aboubakar Fofana, Alexandra Karakashian, Abdoulaye Konaté, Lawrence Lemaoana, Senzeni Marasela, Zohra Opoku and Athi-Patra Ruga. 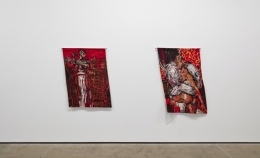 Igshaan Adams (born 1982, Cape Town, South Africa; lives Cape Town) Adams’s cross-disciplinary practice combines performance, weaving, sculpture and installation to investigate hybrid identity in relation to race and sexuality. Raised by Christian grandparents in a community classified as ‘colored’ under apartheid, he remains an observant, but liberal, gay Muslim. 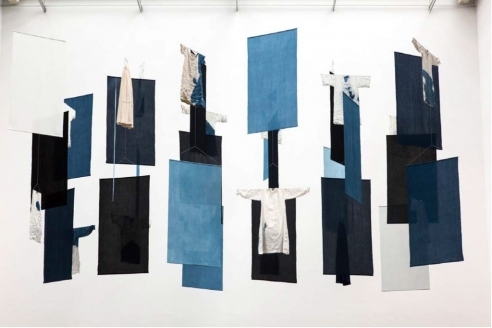 Joël Andrianomearisoa (born 1977, Antananarivo, Madagascar; lives Antananarivo and Paris) Andrianomearisoa is known for his boldly colored artworks using paper and textiles in a wide-ranging practice that encompasses sculpture, installation, design and performance. 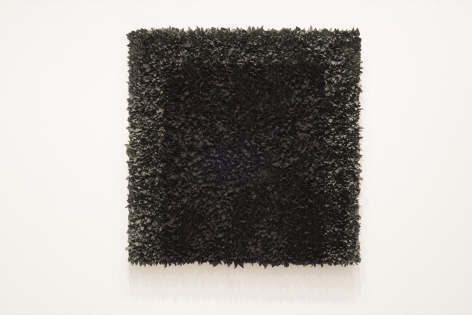 Using diverse media, his work explores the nuances of space, texture and dimensionality, often with an emphatically singular use of the color black. 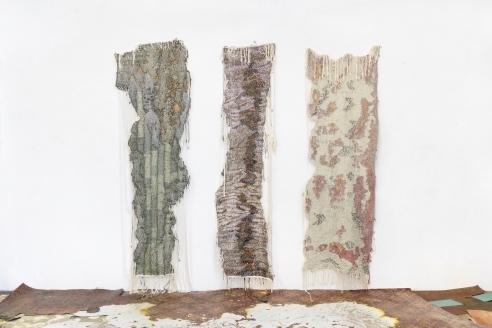 Ayan Farah (born 1978, Sharjah, UAE; lives and works London and Berlin) Farah creates large paintings that are stained, soaked and dipped with natural pigments sourced from across the world – plant dyes, clay, mud, terracotta, ash and India ink. 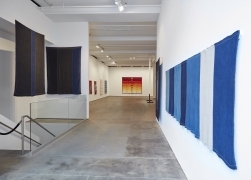 Farah’s practice is informed not only by the history of landscape and color field painting and aspects of land art, but by various traditions of weaving, quilting and embroidery. 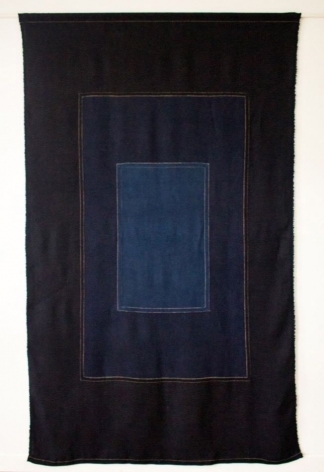 Aboubakar Fofana (born 1967, Bamako, Mali; lives Bamako) Fofana worked for many years as a calligrapher and a graphic designer before following a childhood dream of discovering how to make indigo cloth using ancient techniques indigenous to West Africa. 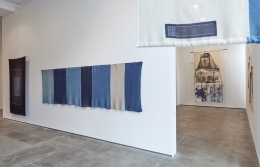 After many years of research, study and practice in Mali, Guinea, Burkina Faso, Senegal, Ivory Coast and Japan, he is now one of the world’s foremost practitioners of fermented indigo vat dyeing and mineral mud-dyeing techniques. 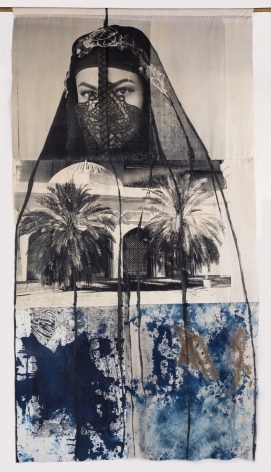 Alexandra Karakashian (born 1988, Johannesburg, South Africa; lives Cape Town) Karakashian explores the metanarrative of various current and historical societies’ relationships to landscape, both in Southern Africa and further abroad. 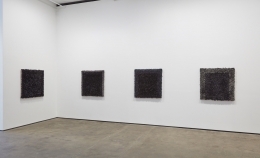 Her practice confronts binaries of ‘black and white’ against a backdrop of neutral tones, referencing both South Africa’s complex history on these terms and her own understanding of ongoing racial discrimination in South Africa and abroad. Abdoulaye Konaté (born 1953, Diré, Mali; lives Bamako) Combining the aesthetics of the local with global subject matter, Konaté merges political commentary and traditional craftsmanship. 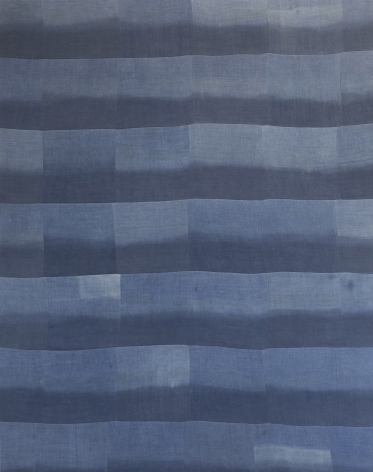 Employing woven and dyed cloths native to Mali, Konaté creates large-scale abstract and figurative compositions. 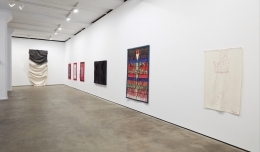 His work often questions the ways in which societies and individuals have been affected by factors such as war, the struggle for power, religion, globalization, ecological shifts and the AIDS epidemic. 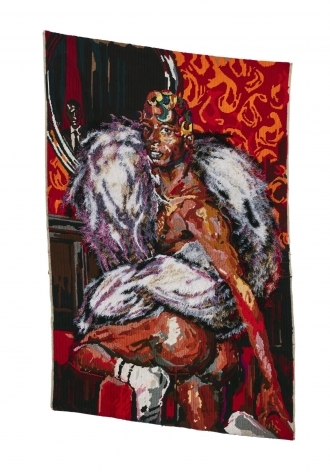 Lawrence Lemaoana (born 1982, Johannesburg, South Africa; lives Johannesburg) Lemaoana produces graphic fabric works that critically engage with mass media in present-day South Africa. Seeing the relationship between media and the ‘people’ as inherently problematic, he identifies and repurposes existing control apparatuses using his trademark cynicism. 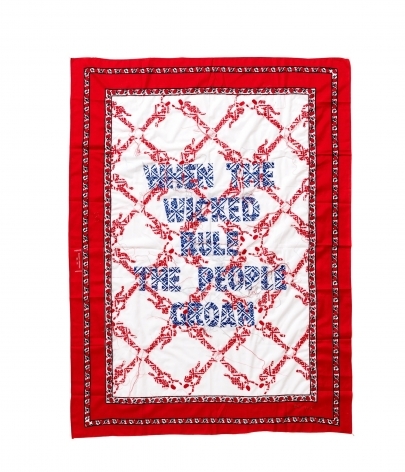 Lemaoana’s embroidered works are emblazoned with appropriated political dictums woven in kanga fabric – a material with its own complex ancestry. Senzeni Marasela (born 1977, Thokoza, South Africa; lives Soweto) Marasela uses photography, photocopy transfers, silk-screening and handicraft to explore collective and personal memory. Her choice of ‘raw’ (unprocessed) fabrics like calico, set against the highly worked quality of lace have, for her, strong ties to colonialism. 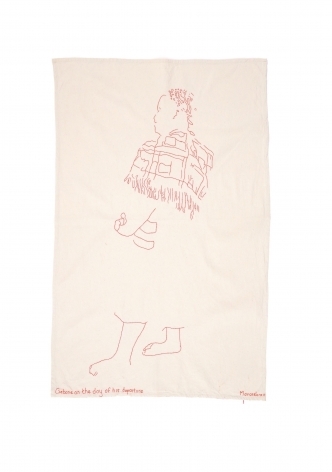 The labor-intensive process of hand stitching is her way of inscribing herself into this past she wishes to explore, as well as attempting to elevate her chosen imagery into a realm of the cherished and respected. Zohra Opoku (born 1976, Altdöbern, Former GDR; lives Accra, Ghana) Opoku examines the political, historical, cultural, and socio-economic influences in the formation of personal identities, particularly in the context of contemporary Ghana. 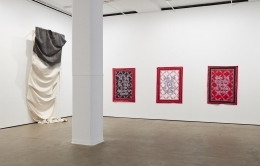 Her socially engaged practice includes installation, performance and visual media. It is centered around textiles and traditional Ghanaian fashion modes, which have been an inherent part of the country’s identity and industry throughout West Africa’s complex history. Athi-Patra Ruga (born 1984, Mthatha, South Africa; lives Capetown and Johannesburg) One of the few artists working in South Africa today whose work has adopted the trope of myth as a contemporary response to the post-apartheid era, Ruga creates work that explores the borders between fashion, performance and contemporary art. Bursting with eclectic multicultural references, carnal sensuality and a dislocated undercurrent of humor, his performances, videos, costumes and photographic images create a world where cultural identity is no longer determined by geographical origins, ancestry or biological disposition, and is increasingly becoming a hybrid construct.